In Brazil, Samsung is still perceived as a tech-only brand and is relatively distanced from its audience. Isobar needed an idea that heightened the human ingredient in its main narrative. 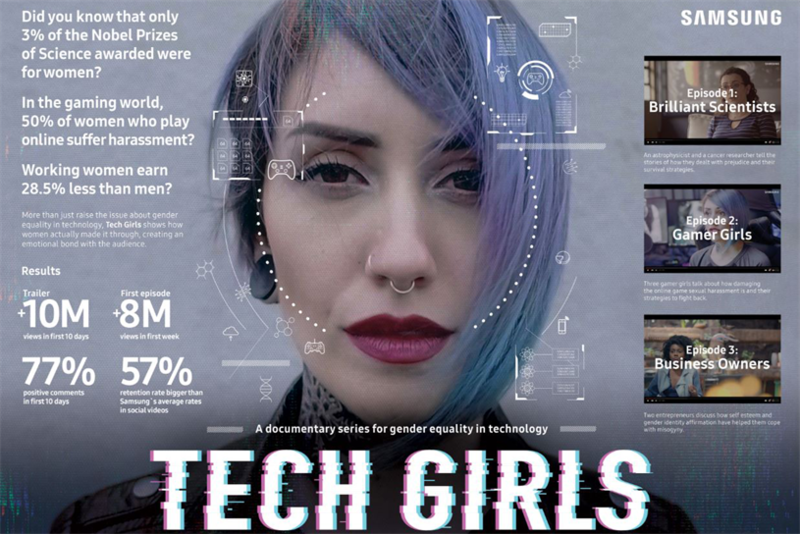 Samsung Tech Girls is a documentary series about women’s grapple with misogyny in the fields of science, gaming and technology. The gender issue was promoted by digging deep into archives to find examples of ridiculous patents put forward by men and approved, while patents for great inventions by women were denied -- such as one man’s patent for a hat, compared with plans for the world’s first wood-cutting machine by Tabitha Babbitt, which were rejected. Judge Nancy Hill, Media Sherpas founder and former 4A’s CEO, said the campaign "takes on a very important form of inclusion and diversity in a thoughtful, strong and creative way. It has legs and depth. And it’s interesting to hear the stories of girls and women who want to make a difference in an industry not open to them."